Aim: The aim was to assess the influence of two irrigation regimens having ethylenediaminetetraacetic acid (EDTA) and ethylenediaminetetraacetic acid with cetrimide (EDTAC) as final irrigants, respectively, on the dentine wettability for AH Plus sealer by comparing its contact angle formed to the irrigated dentine. Materials and Methods: Study samples were divided into two groups (n = 10). The groups were irrigated with 3% sodium hypochlorite (NaOCl) solution followed by either 17% EDTA or 17% EDTAC solution. AH Plus was mixed, and controlled volume droplet (0.1 mL) of the sealer was placed on the dried samples. The contact angle was measured using a Dynamic Contact Angle Analyzer and results were analyzed using SPSS 21.0 and 2 sample t-test. Results: There was a significant difference in the contact angle of AH Plus formed to the dentine irrigated with the above two regimens. AH Plus showed significantly lower contact angle with the regimen having EDTAC as a final irrigant than the one with EDTA (P < 0.05). Conclusion: An irrigation regimen consisting of NaOCl with either EDTA or EDTAC solution as a final irrigant influences the dentine wettability and contact angle of a sealer. EDTAC as a final irrigant facilitates better dentin wettability than EDTA for AH Plus to promote its better flow and adhesion. 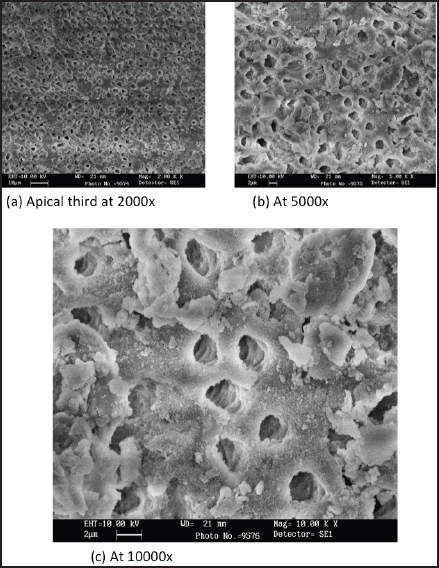 Aim: The aim of this study was to compare the effect on fracture strength, pH and calcium ion diffusion from mineral trioxide aggregate (MTA) Fillapex, iRoot SP, and Ultracal when used for repair of simulated root resorption defects. 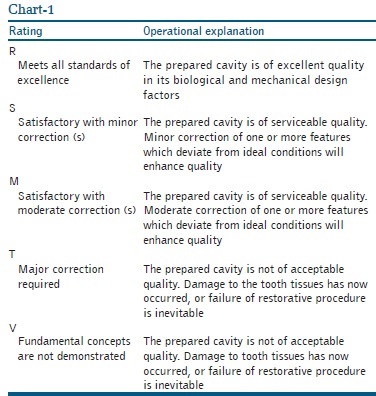 Materials and Methods: Three sets of 40 teeth each were used, and biomechanical preparation was done. Resorption cavity was made at 5 mm from the apex. Teeth were filled with different experimental materials. In control group, saline was used. Samples of fracture resistance were stored in an incubator for 3 months and then subjected to the universal testing machine. To evaluate the pH and calcium ion release were checked at 1 day and 1, 2, 3, and 4 weeks intervals. Data were recorded and statistical analysis done by one-way analysis of variance followed by post-hoc Tukey test. Results: Highest fracture resistance was seen in MTA Fillapex followed by iRoot SP, control, and then Ultracal group. Teeth filled with iRoot SP showed highest pH and calcium ion release followed by MTA Fillapex and Ultracal group. Conclusion: Bioceramic sealers showed high pH, calcium ion release, and good root reinforcement potential. Initial dressing of calcium hydroxide followed by obturation with Gutta-percha and bioceramic sealer may be considered as an alternative treatment modality for inflammatory resorption. Background: With the advances in optical technology, dentistry has been benefitted in varied ways over the ages. Aim: The aim of this study was to assess the effect of dental magnification loupes on psychomotor skill acquisition during preclinical operative exercise. Methods: 40 Typhodont teeth tooth no. 36 and 46 (Frasaco - U.S.A.) were mounted on the acrylic lower jaw base of Phantom Head. Teeth are prepared for class II (MO) cavity with conservative design using micromotor, mouth mirror and probe. Tooth no.36 was prepared using magnifying loupes while tooth no.46 was prepared without the loupes. Data collected was statistically analyzed using Chi square test. Results: The results revealed that tooth preparations were better under magnifying loupes as compared to those without it with statistically significant difference with Kappa value 0.64 for samples with loupes and 0.76 for without loupes. Moreover, the study samples expressed their difficulty for using the magnifying loupes during the tooth preparation since they were using it for the first time. Conclusions: Magnifying loupes help the dental students to have better vision, thus improved dexterity with hands while preparing the tooth for restoration. However, dental students have to get adapted to the loupes for the ease of using loupes. Using loupes frequently may help them to get adapted to the loupes. 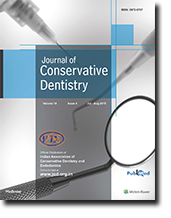 Aim: The aim of this in vivo study was to compare the accuracy of Root ZX and Raypex 5 in detecting minor diameter in human permanent single-rooted teeth. Materials and Methods: Thirty-one patients with completely formed single-rooted permanent teeth indicated for extraction were selected for the study. Crown was flattened for stable reference point and access cavity prepared. Working length was determined with both apex locators. A 15 K file adjusted to that reading was placed in the root canal and stabilized with cement. The tooth was then extracted atraumatically. Following extraction apical 4 mm of root was shaved. The position of the minor diameter in relation to the anatomic apex was recorded for each tooth under stereomicroscope at ×10. The efficiency of two electronic apex locators to determine the minor diameter was statistically analyzed using paired sample t-test. Results: The minor diameter was located within the limits of ±0.5 mm in 96.6% of the samples with the Root ZX and 93.2% of the samples with Raypex 5. The paired sample t-test showed no significant difference. Conclusion: On analyzing the results of our study it can be concluded that Raypex 5 was as effective as Root ZX in determining the minor diameter. Context: Recent introduction of shape memory (SM) nickel-titanium (NiTi) alloy into endodontics is a major breakthrough. Although the flexibility of these instruments was enhanced, fracture of rotary endodontic instruments during instrumentation is an important challenge for the operator. Implementation of supplementary manufacturing methods that would improve the fatigue life of the instrument is desirable. Aim: The purpose of this study was to investigate the role of dry cryogenic treatment (CT) conditions on the microstructure of martensitic SM NiTi alloy. Materials and Methods: Experiments were conducted on Ni-51 wt% Ti-49 wt% SM alloy. Five cylindrical specimens and five sheet specimens were subjected to different CT conditions: Deep CT (DCT) 24 group: −185°C; 24 h, DCT 6 group: −185°C; 6 h, shallow CT (SCT) 24 group: −80°C, 24 h, SCT 6 group: −80°C, 6 h and control group. Microstructure of surface was observed on cylindrical specimens with an optical microscope and scanning electron microscope at different magnifications. Subsurface structure was analyzed on sheet specimens using X-ray diffraction (XRD). 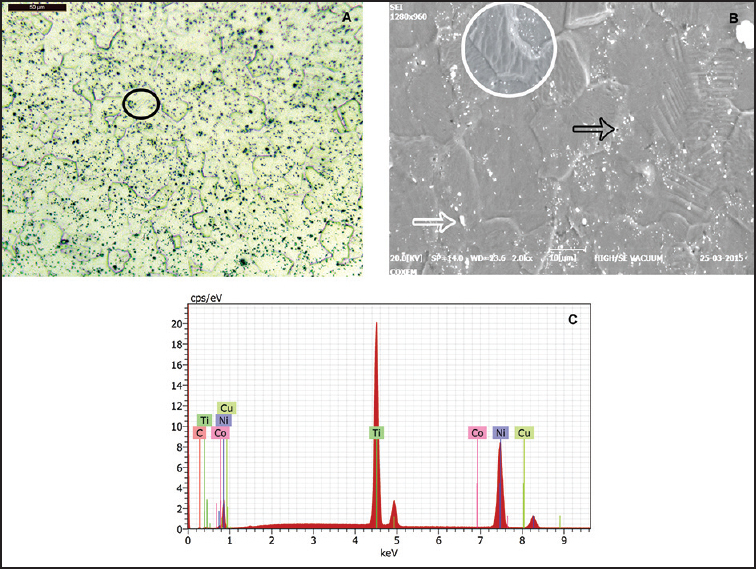 Results: Microstructures of all SM NiTi specimens had equiaxed grains (approximately 25 μm) with well-defined boundaries and precipitates. XRD patterns of cryogenically treated specimens revealed accentuation of austenite and martensite peaks. The volume of martensite and its crystallite size was relatively more in DCT 24 specimen. Conclusions: DCT with 24 h soaking period increases the martensite content of the SM NiTi alloy without altering the grain size. Aim: The purpose of this study was to evaluate the effect of post space preparation on the sealing ability of teeth obturated with mineral trioxide aggregate (MTA) and Gutta-percha. 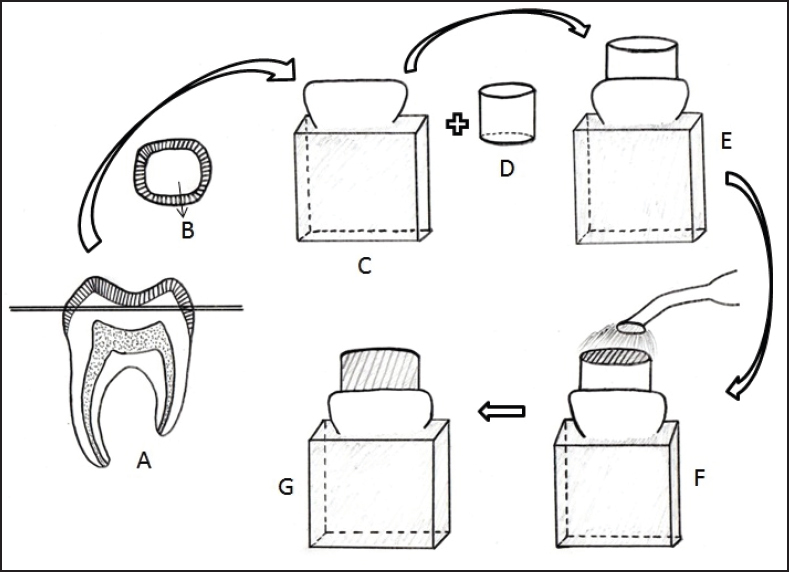 Materials and Methods: Fifty intact human mandibular premolars, after decoronation and biomechanical preparation, were randomly divided into three experimental groups. In Group A (n = 10), the canals were obturated with Gutta-percha using cold lateral compaction technique, followed by immediate post space preparation. In Group B (n = 10), the canals were obturated with 8 mm of MTA and in Group C (n = 10), sectional obturation with 4 mm of MTA was done, followed by delayed post space preparation. All specimens were subjected to bacterial leakage analysis, and the occurrence of turbidity was checked. Results: All specimens in the lateral compaction group leaked. The mean number of days at which leakage was observed in Groups A, B and C were 18.5 days, 93.6 days and 95.5 days. Conclusions: MTA can be considered as an alternative to Gutta-percha as an apical third restorative material for teeth indicated for post and core, as it demonstrates better-sealing ability compared with Gutta-percha. Further, the removal of set MTA for post space preparation does not disrupt the integrity of the remaining apical MTA. Aim: To compare dentinal damage caused by hand and rotary nickel-titanium instruments using ProTaper, K3 Endo, and Easy RaCe systems after root canal preparation. Materials and Methods: One hundred and fifty freshly extracted mandibular premolars were randomly divided into five experimental groups of 30 teeth each and biomechanical preparation was done: Group 1 with unprepared teeth; Group 2 were prepared with hand files; Group 3 with ProTaper rotary instruments; Group 4 with K3 rotary; Group 5 with Easy RaCe rotary instruments. Then, roots were cut horizontally at 3, 6, and 9 mm from apex and were viewed under stereomicroscope. The presence of dentinal defects was noted. Statistical analysis: Groups were analyzed with the Chi-square test. Results: Significant difference was seen between groups. No defects were found in unprepared roots and those prepared with hand files. ProTaper, K3 rotary, and Easy RaCe preparations resulted in dentinal defects in 23.3%, 10%, and 16.7% of teeth, respectively. 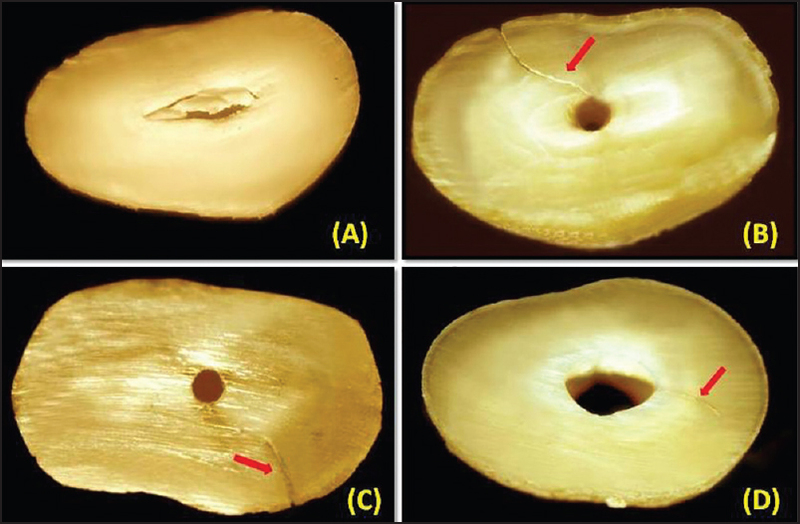 More defects were shown in coronal and middle sections, and no defect was seen in apical third. Conclusion: The present study revealed that use of rotary instruments could result in an increased chance for dentinal defects as compared to hand instrumentation. 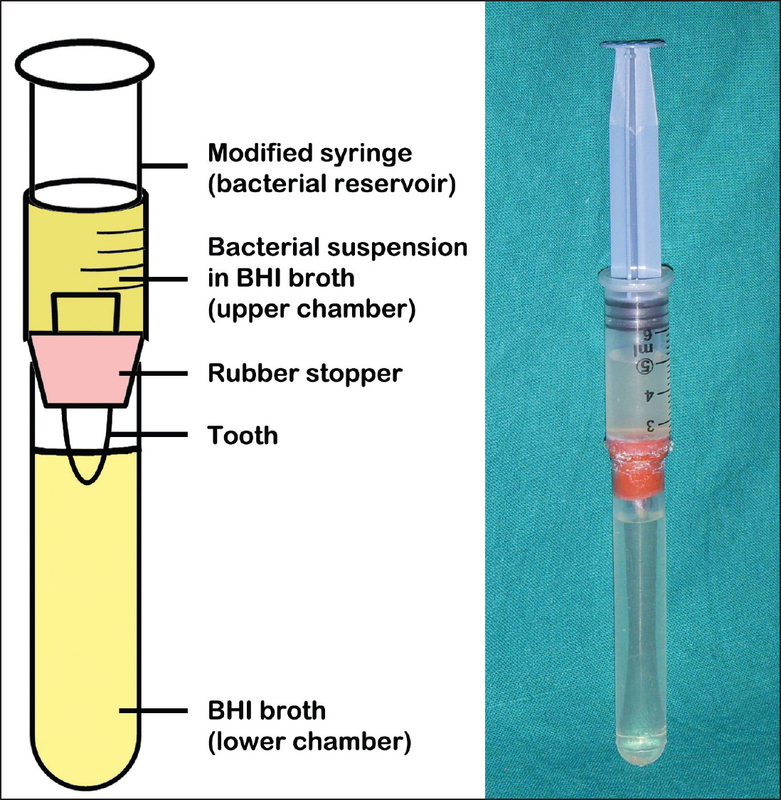 Aims: The aim of this study was to evaluate the reduction of Enterococcus faecalis in curved root canals after various sizes and tapers of the canal preparation. Materials and Methods: Mandibular first molars (n = 103) with curved mesiobuccal canals were divided into one control (n = 5) and 7 experimental (n = 14) groups, were inoculated with E. faecalis (ATTC 29212) and prepared with the following RaCe files (FKG Dentaire) as master apical file: Groups: 25.04‚ 25.06‚ 30.04‚ 30.06‚ 35.04, 35.06 and 40.06. All the experimental groups were irrigated with 2 mL of 1% sodium hypochlorite during instrumentation and finally rinsed with 17% ethylenediaminetetraacetic acid (EDTA) (2 mL) followed by 5.25% NaOCl (2 mL) and sterile distilled water. Colony counting was performed after incubation. Statistical Analysis Used: Resulting data were analyzed using one-way ANOVA and Tukey's post-hoc test, (P < 0.05). Results and Conclusions: All the experimental groups showed significant bacterial reduction (P < 0.001). Although the greater the size/taper or both led to more decreased amount of bacteria, differences between the groups with the identical size and different tapers, and among the groups with the same taper and different sizes were not significant. Based on this study, 25.04 along with using 2 mL of 1% NaOCl during instrumentation, and using 17% EDTA and 5.25% NaOCl as final rinse successively after the termination of preparation, can effectively reduce intra-canal bacteria and preserve root structure. Background: During endodontic retreatment, relative difficulty exists in removing the filling material and maintaining the canal anatomy. Usage of nickel-titanium (NiTi) rotary retreatment instruments is widely accepted, but there is a lack of adequate literature evidence about their canal centering ability. Aim: To compare the canal centering ability of rotary NiTi retreatment systems. 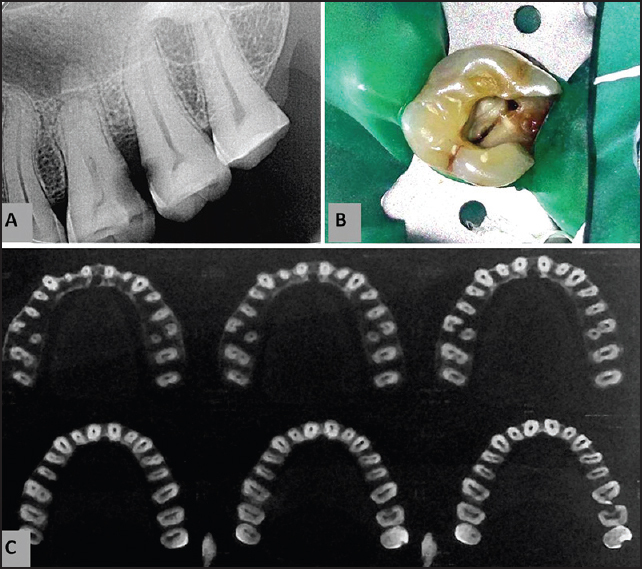 Materials and Methods: Mandibular first molars with mesiobuccal canals with canal access angle of 20-40° were used. Canals prepared until ISO 25, 0.06 taper. Obturated with three different techniques lateral compaction, Thermafil, and Resilon/Epiphany. Retreatment was carried using three different systems ProTaper retreatment, Mtwo R and REndo. Specimens were subjected to computed tomography analysis at coronal, middle, and apical third of the root canal preobturation and postretreatment procedure. Statistical Analysis Used: One-way ANOVA and post-hoc Tukey test. Results: No statistically significant difference with three retreatment systems. Variation existed among all the subgroups at the coronal, middle, and apical third of the root canal. Conclusion: All retreatment systems with three obturation techniques showed eccentricity within acceptable limits. REndo, MtwoR showed better canal centering and ProTaper retreatment system showed tendency for eccentric canal preparation, especially in apical third. Objectives: Efficacy of an ideal antimicrobial agent depends on its ability to eliminate microorganisms while causing minimal toxicity to host cells. The purpose of this study was to assess the effect of ethanolic and water extracts of Salvadora persica (SP) on proliferation and viability of human dental pulp stem cells (hDPSCs). Materials and Methods: In this in-vitro study, the effects of seven concentrations of ethanolic and water extracts of SP (ranging from 5.75 mg/ml to 0.08 mg/ml) on hDPSCs were evaluated using the 3-(4, 5-dimethylthiazol-2-yl)-2, 5-diphenyl tetrazolium bromide assay. The results were analyzed using one-way ANOVA and Tukey's post-hoc test. P < 0.05 was considered statistically significant. 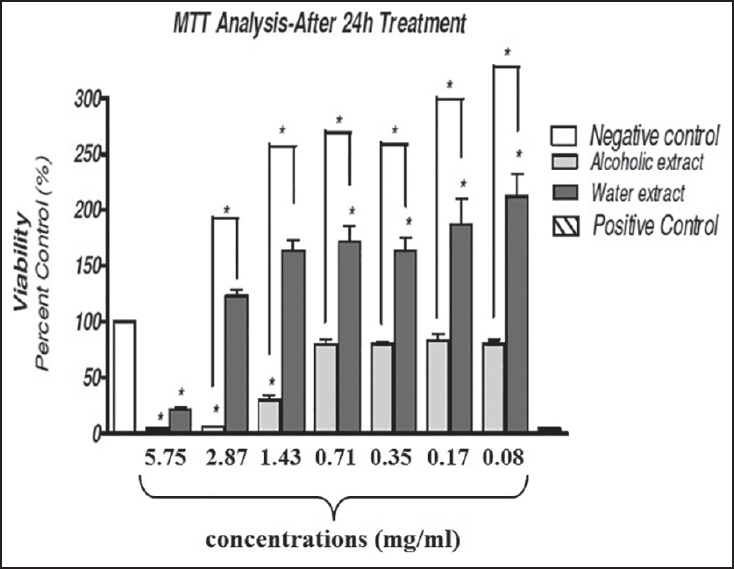 Results: Water extract of SP only had cytotoxic effect at 5.75 mg/ml concentration; and caused significant cell proliferation at 1.43-0.08 mg/ml concentrations at 24 h (P < 0.05). At 48 h, only 0.17 and 0.08 mg/ml concentrations caused significant cell proliferation (P < 0.05). Ethanolic extract of SP at 5.75-1.43 mg/ml concentrations showed severe cytotoxic effects at 24 and 48 h. Other concentrations had no significant effects on cells (P > 0.05). Conclusion: The highest concentrations of both water and ethanolic extracts of SP had cytotoxic effects on hDPSCs. Water extract of SP has favorable effects on cell proliferation at specific concentrations in a time-dependent manner. Aim: The aim of this study was to compare smear layer removal after final irrigant activation with sonic irrigation (SI), manual dynamic agitation (MDA), passive ultrasonic irrigation (PUI), and conventional syringe irrigation (CI). Materials and Methods: Forty mesial canals of mandibular first molars (mesial roots) were cleaned and shaped by using ProTaper system to size F1 and sodium hypochlorite 3% and 17% ethylenediaminetetraacetic acid. The specimens were divided into 4 equal groups (n = 10) according to the final irrigation activation technique: Group 1, PUI; group 2, manual dynamic activation (MDA); group 3, SI; and group 4, control group (simple irrigation). Samples were split longitudinally and examined under scanning electron microscope for smear layer presence. Results: Control groups had the highest smear scores, which showed the statistically significant highest mean score at P < 0.05. This was followed by ultrasonic, MDA, and finally sonic, with no significant differences between them. Conclusions: Final irrigant activation with sonic and MDA resulted in the better removal of the smear layer than with CI. Aim: The in-vitro study compared the shear bond strength (SBS) of three recently introduced dual-cure resin based core build-up materials namely ParaCore, FluoroCore, and MultiCore. 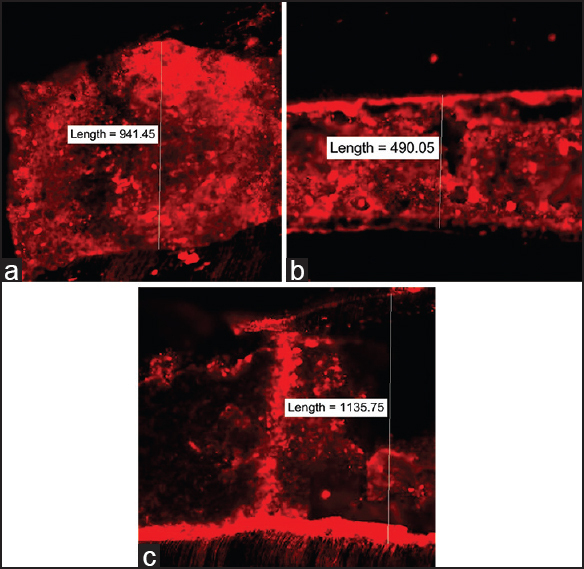 Materials and Methods: One hundred twenty extracted permanent human mandibular molar teeth were taken and sectioned horizontally beneath the dentinoenamel junction to expose the coronal dentin. The specimens obtained were divided into three main groups based on the materials used and then further divided into four sub-groups based on time interval with ten samples each. 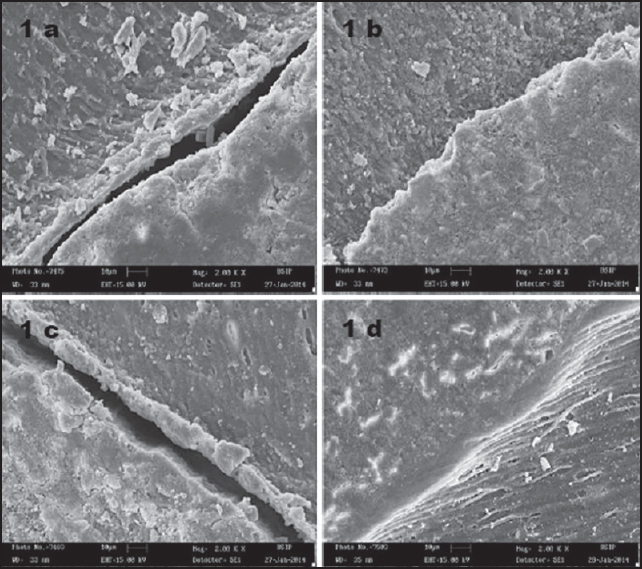 The dentin surface was treated with the respective adhesives of the groups and then bulk filled with core build-up materials. The attained samples were than subjected to shear loading in Instron Universal Testing Machine. The data were tabulated and statistically analyzed using analysis of variance (ANOVA), Tukey's HSD, and Levene's test. Results: The mean SBS was highest in MultiCore at all time periods as compared to FluoroCore and ParaCore and was also higher at 48 h thermocycling in all three groups studied. Conclusion: MultiCore dual-cure resin based core build-up material showed the highest mean SBS as compared to FluoroCore and ParaCore. SBS was not negatively affected by thermocycling. Most often, a clinician working on maxillary first molar when anticipates an aberration thinks of an extra canal but rarely does he preempt fewer canals. Maxillary first molar is a tooth, which has been extensively reviewed with respect to its external and internal morphology. Abundant literature related to its anatomy is available, but reports on incidence of two roots and two root canals in maxillary first molar are very limited. Here, a case of maxillary first molar is presented that had two roots: one palatal root with Type I canal configuration and one bulbous fused buccal root with Type V canal configuration; a unique root and canal configuration not seen in any of the earlier reported cases. Diagnosis of root canal aberrancy and subsequently, accurate management of the tooth was greatly facilitated by cone beam computed tomography (CBCT) scan. The relevance of CBCT in improving treatment prognosis is greatly emphasized in this report. Mandibular molars demonstrate considerable anatomic complexities and abnormalities with respect to number of roots and root canals. Clinicians should be aware that there is a possibility of the existence of a fewer number of roots and root canals than the normal root canal anatomy. Mandibular first molar with a single root and single canal was diagnosed with the aid of dental operating microscope and multiple angled radiographs. 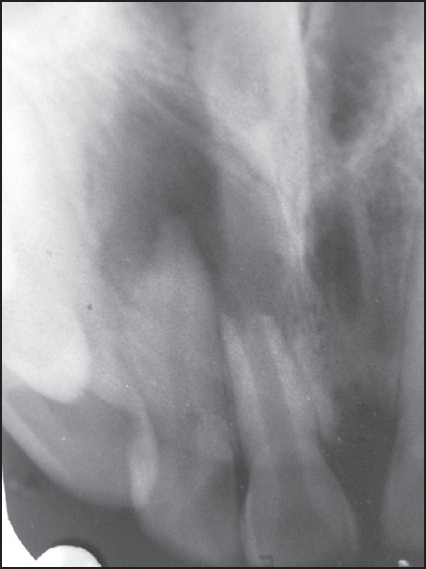 This case report presents a rare case of successful endodontic management of mandibular first molar with a single root and root canal. Immature nonvital teeth can often be associated with periapical lesions. Presence of external inflammatory resorption can complicate the treatment plan. A 21-year-old female patient presented with a large periapical lesion in relation to teeth 11 and 12. Tooth 11 was an immature tooth undergoing external inflammatory resorption. Aspiration through the root canal was carried out to evacuate the purulent fluid in the periapical lesion. Triple antibiotic paste was then placed as an intracanal medicament for a period of 2 weeks, followed by calcium hydroxide therapy for a period of 2 months. 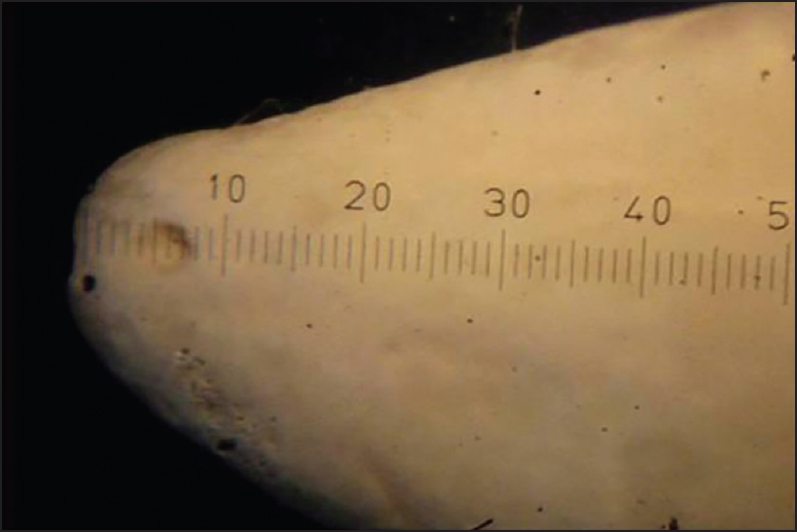 Mineral trioxide aggregate was then placed as an apical barrier to a thickness of about 4 mm. Obturation of the remainder of the canal space was done after 48 h. Complete periapical healing was evident after 1 year and 6 months. Nonsurgical healing of a large periapical lesion associated with an immature tooth displaying external inflammatory resorption can be successfully achieved.